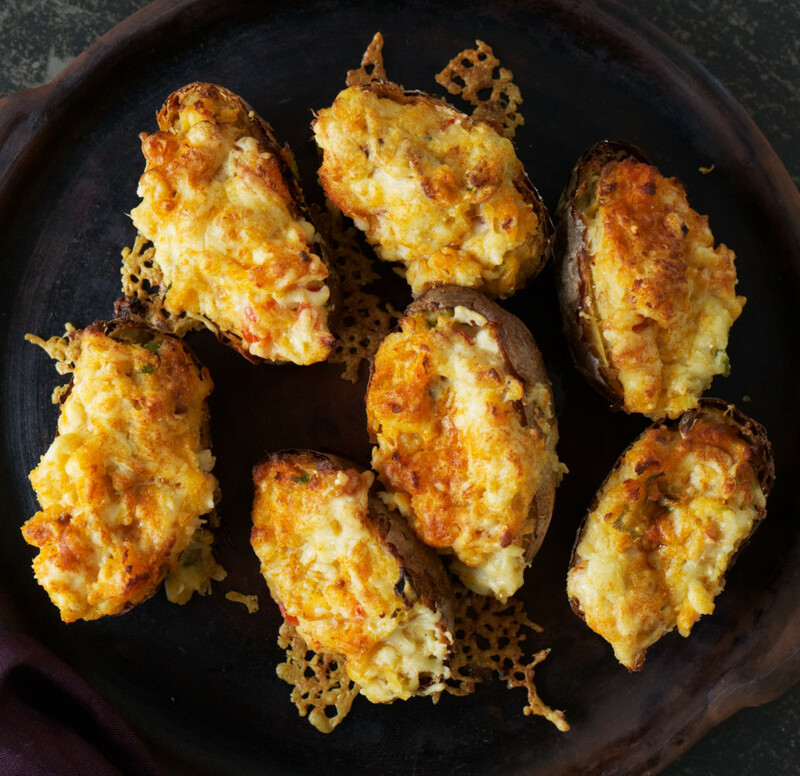 Jacket potatoes never fail to amaze me – they are easy to prepare, make a home for small amounts of tasty tid-bits and fill you up cheaply! 1 Preheat oven to 210°C (400°F). Put a teaspoon of flaky sea salt on paper towels, then roll wet potatoes in salt. Transfer potatoes to the oven rack using tongs (or you’ll get all the salt on your hands!) and cook for 1½ hours, turning occasionally, or until skins are very crunchy. 2 Chop tomatoes, discarding cores, and drain for 15 minutes in a sieve. Tip onto paper towels and mop gently. 3 When potatoes are ready, remove from oven with tongs and immediately cut each one in half (avoid the steam). Scoop out flesh and mash in a china bowl with a potato masher, adding butter, most of the hot milk, ½ a teaspoon of salt, paprika or cayenne pepper, and celery salt if using, spring onions, parsley, and half the cheddar. Check consistency, adding the remaining milk if needed to make the texture nice and fluffy. Pile half the potato purée back into potato skins, then top with tomatoes and smoked fish. Spread the rest of the potato purée on top, then transfer to a shallow ovenproof dish. Scatter with remaining cheese. 4 Return potatoes to oven and bake for around 15 minutes, or until cheese is golden. Serve hot. Take my advice when making jacket-baked potatoes and prick the potatoes all over with a skewer. If you forget, be careful removing them from the oven because they can puff up with hot steam under the skin, then explode when you touch them. Hot potato all over the oven is a drag to clean up, but worse, hot potato on your face can give a serious burn. I always put a baking sheet under the oven rack to catch the falling flakes of salt (it’s easier to clean than the bottom of the oven). Mashing the potato flesh in a china bowl will keep it hotter than doing it in a glass or metal bowl as china retains the heat. Weirdly, I find there is never enough potato to refill the potato skins, so I like to cook an extra potato to ensure there’s plenty, but even so, I don’t pack it down in the skins, I just keep it nice and soft and airy. 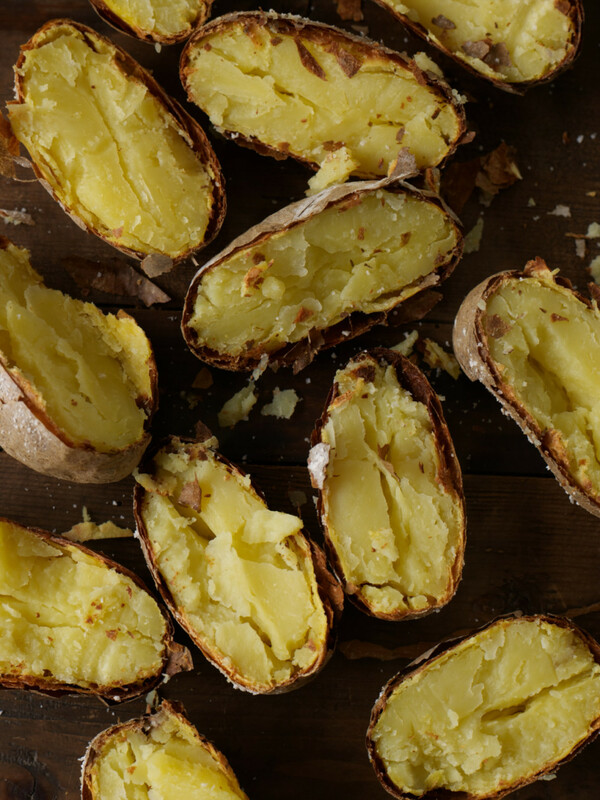 Celery salt is optional, but it does add a boost of flavour to these potatoes. You can use what you have to hand in the filling: leftover cooked peas, shredded roasted chicken, chopped ham or fried bacon. I like to serve these scrumptious potatoes with poached eggs – along with a bottle of Culley’s Hickory or Chipotle sauce, or classic Tabasco sauce – and a side salad. Whoop whoop. You’ll be happy as sand boys after eating this lot! And, the potatoes are gorgeous plain, serve hot and crunchy, with flaky sea salt and fresh butter.